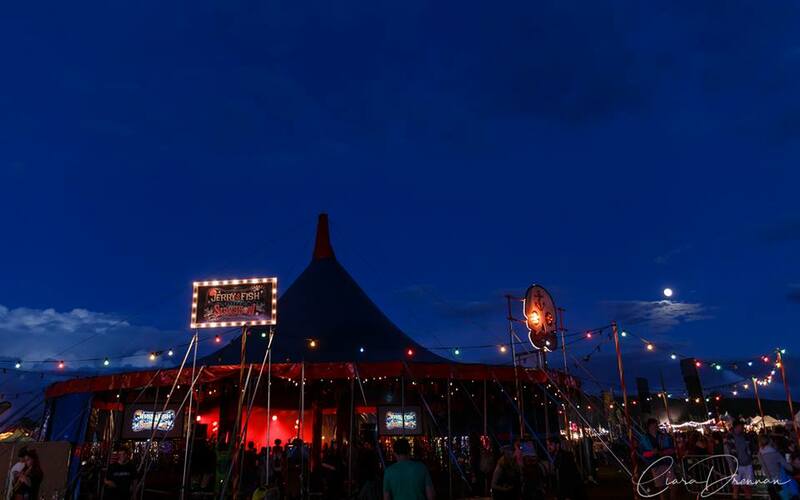 The Jerry Fish Electric Sideshow ≈ Celebrating “Unity through Diversity” victoriously returns to The Electric Picnic’s Late Night Arena for the sixth year in a row. As The Jerry Fish Electric Sideshow promises once again to be the highlight of this years picnic, delivering three debauched days and nights of mind blowing, soul bending entertainment including the hippest after hour club spot in the known universe “SIDESHOW DISCO”. Let’s start a fire! ≈ Party in our tent and Everybody is Welcome! Come and hang out with all the carnival sideshow freaks and burlesque artists performing at The Jerry Fish Electric Sideshow with more than a few hot surprises. WITH CARNIVAL SIDESHOW PERFORMANCES AND BURLESQUE CABARET BETWEEN ACTS FROM OUR SIDESHOW SWEETHEART FOXY P COX, THE PONY GIRLS, TERRI FEIRCE, DESMOND O’CONNOR, JELLY BOY THE CLOWN (SQUIDLING BROS.), DIRTY CIRCUS, GRIM SQUEAKER AND MANY, MANY MORE CARNIVAL DARLINGS.